Happy 4th of July! As we all gather together with family and friends to celebrate the birthday of our country, the American Flag is a prominent focus. July 4th is a great day to learn a little about our flag, and the history of its design and construction. As fashionistas, we all know a thing or too about presentation, and a flag to present our country… well that needs to be perfect. The fashion of the American Flag evolved as all fashions do. From thirteen stripes and thirteen stars in 1777, to fifteen stripes and fifteen stars in 1794, back to thirteen stripes and 15 stars in 1818, and finally to thirteen stripes and 50 shining stars since 1960, the flag we know today has been the official design for 53 years. Betsy Ross was the first designer of the American Flag. She designed and constructed the thirteen stars and thirteen striped flag during the American Revolution. She arranged the thirteen stars in a circle to represent the thirteen colonies, and has shown to distinguish her design from the flag designs to come. Blue: Vigilance, Perseverance, and Justice. Fashion evolution is everywhere. Especially in something so historical, official and respected; design and make become important and necessary to ensure the proper representation. Just as we dress to impress, and are conscious of how our choices represent who we are, the American Flag represents who we are as a country. From thirteen stars to fifty, our flag has stood and still stands for growth, freedom, strength, and unity. 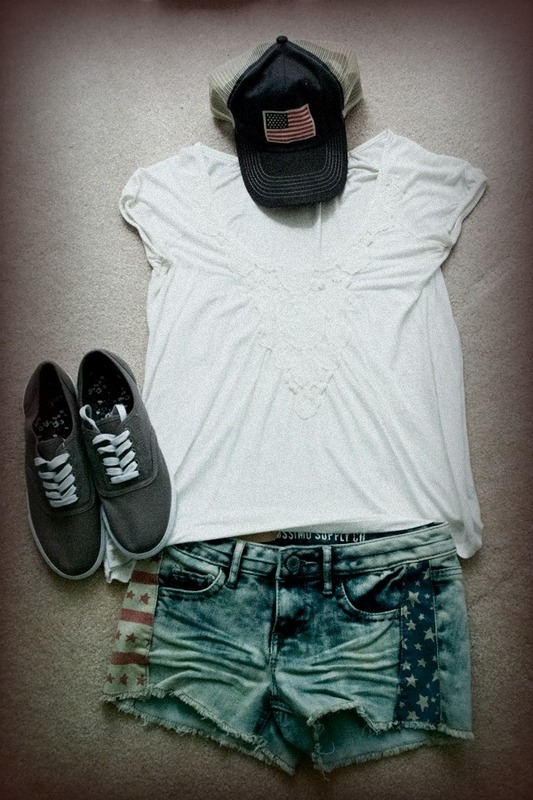 I will leave you with an outfit I put together to wear today 🙂 The flag can be worn; and to embrace my “sporty chic” side, I just HAD to have this American Flag baseball cap!